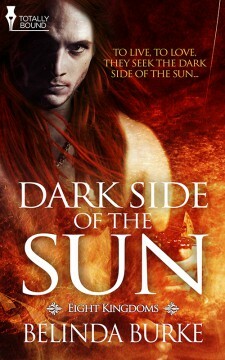 Dark Side of the Sun: Book one of the Eight Kingdoms series, Dark Side of the Sun begins the tale of Macsen and Bran, winter and summer, love and war. From the back cover: A thousand years ago, Milesian invaders gained ownership of Ireland from Summer’s Queen through trickery. Since that day, the green isle’s native sidhe have been imprisoned in their hidden kingdom, bound by their ancient pact with the Milesians. Now, the treaty has been violated. The Milesians have stolen Bran Fionnan, the son of Summer’s queen. Trapped in the human world with no way of returning home, Bran is held under a death threat that forces him to work for his captors. He must forge weapons the Milesian huntresses can use to slay their new foe—the Red King. The Red King is Macsen Cadoc, a vampire—a hunter who cannot stand being hunted. He seeks vengeance for the Milesian attacks in spilled blood—Milesian blood, and the blood of the sidhe traitor who has forged their weapons. When the one he finds is a victim, not a traitor, everything changes. Bran Fionnan is the Milesians’ most valuable prize, but from the moment Macsen sees him, he wants him…and the Red King is not accustomed to being denied—by anyone. What begins with desire may end in extraordinary ways, but first there are questions that must be answered. What is love? Can it help Bran overcome lost ties and a lifetime’s worth of anger? Can it help the Red King gain more than the satisfaction of his lusts? You can purchase Dark Side of the Sun at Pride Publishing, Amazon, Barnes and Noble and other retailers, in e-book and paperback!